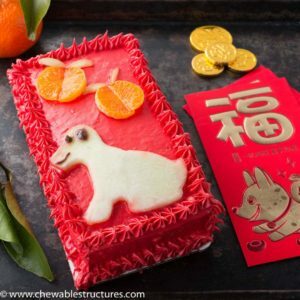 Ring in 2018 year of the dog with this adorable Chinese New Year dessert topped with a honeydew dog, lucky mandarin oranges, and sweet grapes. I decorated a vanilla cake to resemble a “hong bao,” also known as a red envelope or red pocket. 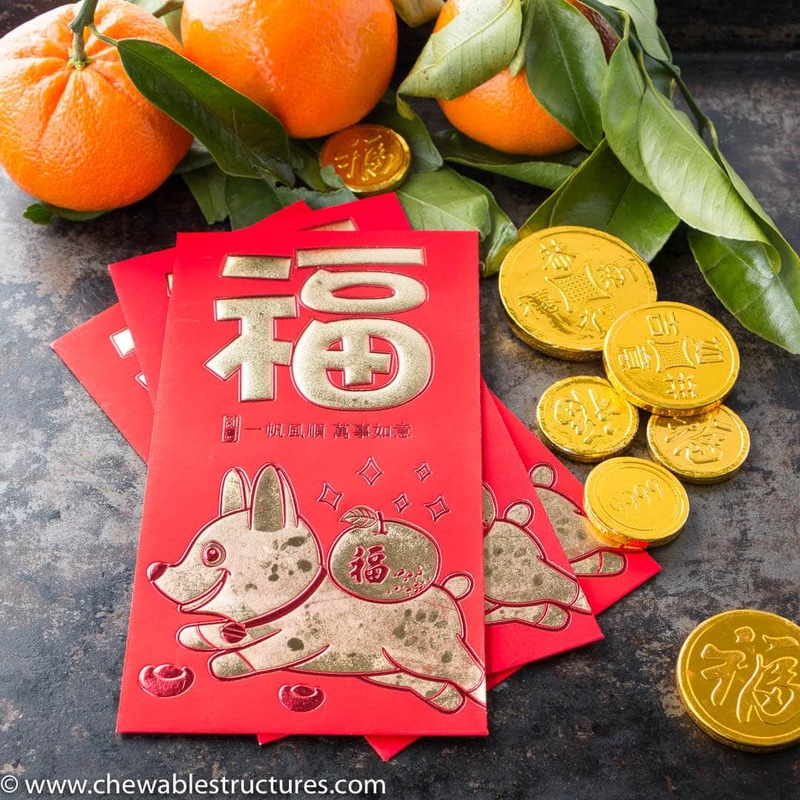 “Hong Bao,” also referred to as red pocket or red envelope. When we were kids, my parents always slipped a red envelope and mandarin orange under our pillows the night before Chinese New Year. The red envelope was a gift to wish happiness and to bless our New Year. It also included a few dollars too! The red color is significant because it symbolizes good luck while the mandarin orange symbolizes prosperity. Since it’s the year of the dog, I used a dog cookie cutter to easily cut out the dog-shaped honeydew slice for the top of the cake. Since I only need a few honeydew slices for decorating, I was able to save the rest of the honeydew for a yummy fruit salad. WATCH MY RECIPE VIDEO BELOW to see how to celebrate the year of the dog with something sweet. It’s super fast to build the red envelope cake, because I’m using a dog cookie cutter, Betty Crocker’s Super Moist French Vanilla Cake Mix, and Wilton’s red (no taste) concentrated paste. Happy Chinese New Year! I hope this year brings you good health and lots of prosperity! Ring in the year of the dog with this lucky Chinese New Year dessert topped with honeydew, grapes and mandarin oranges. I decorated a vanilla cake to look like a “hong bao,” also known as a red envelope or red pocket. Heat oven to 350°F. Line a 13”x9” pan with parchment paper. Spray the bottom and sides with vegetable oil. In a large bowl, add cake mix, water, vegetable oil and eggs. Mix together with an electric hand mixer or a whisk. Pour mixture into the pan. Bake for 26 minutes or until done. (To check if it’s done, poke the middle of the cake with a toothpick and when removed, the toothpick should be clean.) Let the cake fully cool. Cut the cake into three 7”x4” rectangles and transfer to individual cake boards. Using a small offset spatula, add a thin layer of icing to the cake. To decorate the edges, place half a cup of the icing in a piping bag with a Wilton #30 tip. Refrigerate cake for at least 1 hour. Cut out the dog-shaped honeydew slice using the dog cookie cutter. Slice the mandarin orange and grapes. Watch the video above for a better visual. This is optional: You can add facial features to the honeydew dog (eyes, mouth, ears) by placing chocolate frosting in a piping bag and Wilton #2 tip. Notes: 1. If you make the cake and add the frosting the night before, make sure to refrigerate in an airtight container (otherwise, the edges of the frosting will form a darker red crust).